A group of freshman Democrats in the House are countering President Donald Trump's proposal to end the partial government shutdown, despite Speaker Nancy Pelosi's (Calif.) opposition to any compromise that includes border wall funding. On Tuesday, the initial draft of a letter to Pelosi authored by Rep. Elaine Luria (Va.) and other freshmen House Democrats was made public. The letter, which was first reported by Politico, urges the speaker to "guarantee a vote" on Trump's request for $5 billion to construct a border wall in exchange for the president agreeing to reopen the government beforehand. "Once the government is reopened, the Democratic Majority will immediately begin debate in committee on the supplemental discretionary funding request by the Department of Homeland Security (DHS) for border security," Luria and her fellow freshman wrote. "This will allow DHS leadership to explain in detail how the funds will be used and whether this expenditure will have the reported results presented by the president." Arguing that a debate would also allow members to "offer amendments to address" the Deferred Action for Childhood Arrivals program and other protections for illegal immigrants, the authors seemed to imply such a deal would be a too good pass up for both sides. "We promised our constituents that we would seek bipartisan solutions, and we feel that this proposal would gain bipartisan support and allow a transparent process to evaluate the true needs of border security and provide much-needed reform to our immigration process," the authors added. The letter appears to be drafted in response to the compromise floated by Trump during a televised address from the White House on Saturday. In his remarks, Trump announced he was willing to grant a three-year temporary extension of DACA and other programs—covering more than 700,000 illegal aliens—in exchange for border wall funding. Although Pelosi claimed the president's proposal was a "nonstarter," several of the newest members of her majority seemed to disagree. Shortly after Trump's address, Democratic congressman Ben McAdams, a freshman from Utah, expressed optimism that a solution was increasingly possible now that DACA was on the bargaining table. "I’m glad the President now seems willing to discuss solutions for #DREAMers," McAdams tweeted. "I’ve voted 8 times to reopen the government. Let’s do it already and follow through on strong border security and immigration reform including a permanent fix for #DACA." Alyson Heyrend, the congressman's communications director, told the Free Beacon that McAdams was "collaborating" with Luria on the letter to Pelosi and "intends to sign it." "Congressman McAdams wants to see members of Congress and the president together work out a bipartisan solution to end the shutdown and address border security, permanent protection for DACA recipients, and other aspects of immigration reform," Heyrend said over email. Likewise, Rep. Antonio Delgado, a freshman Democrat from New York, said there was "common ground" around which a constructive solution to the shutdown could be forged. "I am not here to be a partisan or extreme, I’m here to figure out how we can solve this problem and open up the government and get back to the business of serving the people," Delgado told his constituents during a town hall on Monday. "I don’t think there’s much disagreement on the fact that we do have to figure out how to secure our borders. We do have to … correct our immigration system, it is flawed, it is broken, we do need … to solve the problem and do so in a collaborative and cooperative fashion, absolutely." It is unclear if Delgado is authoring the letter along with Luria or plans to sign onto it before it is delivered to Pelosi. Neither office returned requests for comment on this story. A source, who requested anonymity but was familiar with the inner-workings of the House majority, told the Free Beacon the letter was a "diplomatic attempt" to counteroffer the president's proposal without drawing the ire of the speaker. "If you're a newly elected member of the House, you're in a precarious position," the source said. "It's difficult for any member of the majority, let alone a freshman, to overrule the will of leadership. 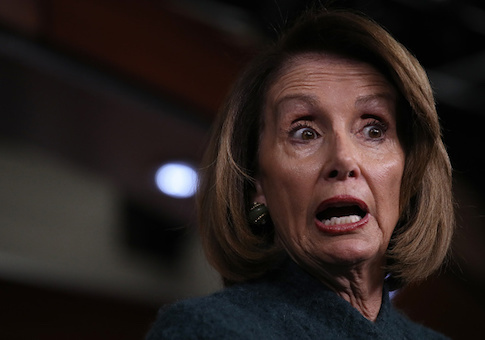 This holds even truer since Speaker Pelosi has shown a willingness to punish those that vote against her by denying their requests for committee assignments." "These members are trying to negotiate with the president in the only way they can," the source added. "It isn't shocking that the letter leaked before it went to Pelosi." This entry was posted in Politics and tagged Donald Trump, Government Shutdown, House Democrats, Immigration. Bookmark the permalink.